3, We have our designers, tailor and factories, therefore we are cinfident to meet your needs. Warmly welcome inquiry for our cooperation. 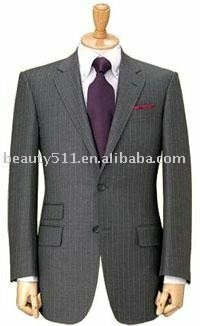 This is a brand new single breasted formal suit dress with excellent quality. competitive price, prompt delivery,great service and solid reputation. Soft shoukder construction. Non vented back,sleeves each have 3 covered buttons. Pants are adjustable an dare pleated with black satin lines pants.100% po;y.